While his age proves he’s still a young man, DJ Brian B is an industry veteran having recently passed the 15-year mark. A Southern California native from Orange County, DJ Brian B got his start DJ’ing after performing in local cover bands as a vocalist/keyboardist straight out of high school. A local bar owner gave him an opportunity to DJ their first foray into the nightclub scene and DJ Brian B seized the moment. His Saturday night dance party became so popular that the bar moved their stable Friday night programming to Thursdays and made the open format dance parties a Friday/Saturday night weekend event. Other clubs in the area started booking DJ Brian B and he eventually had to hire and train 2-3 DJs to fill the demand. Pioneer Electronics (DJ equipment manufacturer) took notice and DJ Brian B began demonstrating all their Pro Audio products at various tradeshows and private showcases. This eventually caught the eye of Hollywood and soon DJ Brian B started mixing celebrity private bashes. The list of high-profile clients include Elton John, P Diddy, Snoop Dogg, Gwyneth Paltrow, Tony Hawk, Jim Carrey, ESPN X Games, and the Dr. Phil Show to name a few. Speaking of music, DJ Brian B has always been a multi-genre DJ. Whereas a lot of DJs stick to one or two formats, he’s never been that type of DJ. Ever since he started, DJ Brian B has always played all types of music. It stems from growing up in a musical household where Earth Wind & Fire, James Brown, Depeche Mode and Madonna records were always heard through their home stereo system. Present day, DJ Brian B resides in New York, NY and is being booked and performing for every event imaginable all over the United States. He continues to keep his finger on the pulse of the latest musical trends – creating his own custom mixes, DJ’ing both private and public events, and now offering production services. 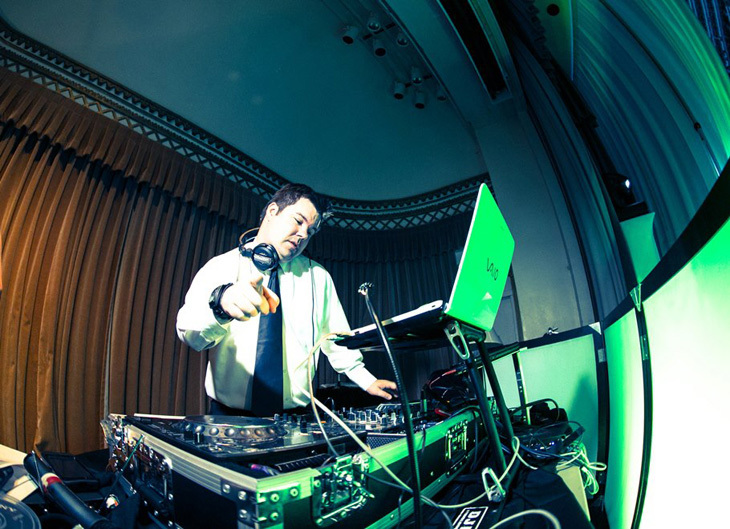 With an infectious laugh and a zest for life (and not a lot of sleep while jet-setting around the country), DJ Brian B is a favorite with everyone from party goers to event planners to club owners. It may sound cliché, but he truly sees music as the universal language that brings people together. While his posted online mixes give you a glimpse of his talent, it’s his live performances that separate him from the rest. He’s a live performer, first and foremost, and will be rockin’ crowds till the day he dies. Brian B is great to work with and will bring your event’s energy to the next level! Our wedding planner recommended DJ Brian B to us and we couldn’t have been happier. He’s based on the east coast but he regularly travels to Miami, LA and maybe Chicago if I remember correctly. Brian was great at articulating what he wanted from us ahead of time, and has a very easy do-it-yourself client portal. We didn’t always have a song in mind for a specific moment (i.e. after ceremony song), but Brian took our style direction and filled in with what he thought would work, and it always did. It was like he was in our head. We also had a couple calls with him to discuss our style, our guest dynamics and what we’re hoping to get out of him. What we most loved about Brian was that he didn’t just create a playlist and press play. His songs transitioned seamlessly and he has so many tricks up his sleeve to take traditional wedding music and add a modern touch. We were worried about getting our guests on the dance floor but he did a great job getting everyone engaged and we danced the night away. He made the night fly and we weren’t ready to go when the venue started kicking us out. Great job Brian and thank you!